The music was chosen on an All Saints’ theme, with particular connections to Gloucester and the choir itself. 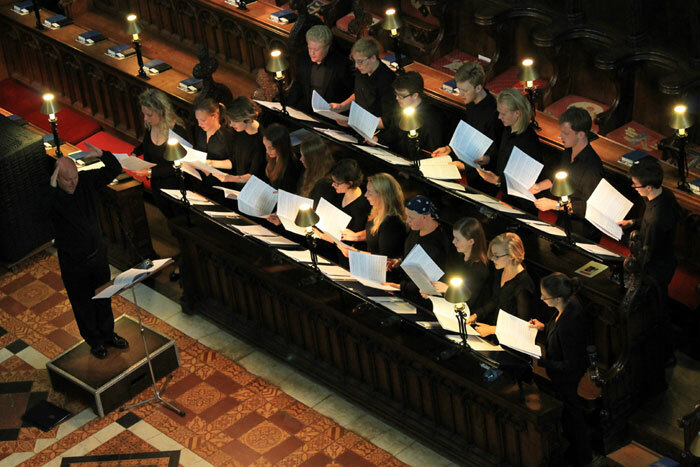 The ‘Gloucester Service’ canticles were written especially by the broadcast by Millennium Youth Choir singer and Assistant Conductor Owain Park, and the Responses are by another member of the choir, Kerensa Briggs. A recent graduate of Bristol University, Kerensa is the daughter of David Briggs who is a former Organist of Gloucester Cathedral. The anthem We love the place, O God was written by Herbert Sumsion, who was also Organist of Gloucester Cathedral, but the piece was actually written for the choir of Westbury-on-Trym Parish Church in Bristol where David is now Director of Music. The final hymn is David Ogden’s arrangement of Vaughan Williams’ Sine nomine setting of For all the saints, which David wrote originally for the Millennium Youth Choir to sing on a BBC Songs of Praise programme in 2009. Daniel Moult’s thrilling and virtuosic organ voluntary was written for him by Ronald Corp.